A year ago, I posted some of my Dad's recollections of Babe Mansbridge here. Babe, who's real name was Ralph, was a champion bronc rider from what I call the Thunder Butte area. My Dad knew Babe, who among other things was famous for riding the local legend, Tipperary, who was one of the most famous bucking broncs of the early 1900's. I'm not sure whether the print represents a colorized photo, a painting, or some other form of caricature, but brush strokes seem evident on the horse's underbelly. But, this print does give us a sense of Babe in his heyday and perhaps gives us an idea of what Babe may have looked like while riding a bucking bronc in competition. The print shows Babe riding the bucking horse, Sure Fire, in finals at the Black Hills Roundup in Belle Fourche, South Dakota, in 1924. Funeral services for Ralph "Babe" Mansbridge will be held at 1:00 p.m. today, (Wednesday) at the Masonic Temple in Spearfish, with Rev. Arthur W. Westwood of the United Church of Christ officiating. Burial will be in the Rosehill Cemetery under the direction of Fidler Funeral Chapel. Mansbridge, a well known rancher, cattle buyer and rodeo rider, died in the Lookout Mountain Hospital, Spearfish, Jan. 21 following a siege of pneumonia and other complications. He was about 70. Babe was a true westerner at heart although he was too young to take part in the activities of those days of "Cattle Barons and Roundups." 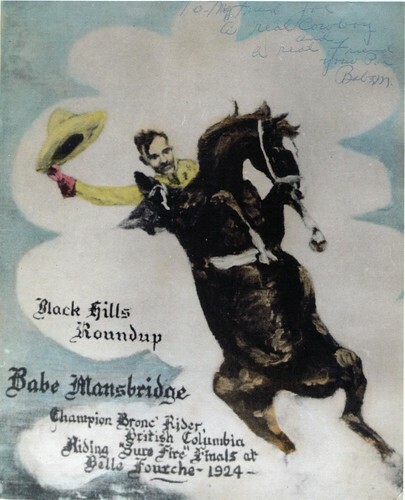 As a little boy of 5 or 6 he learned to ride a horse and became the cowboy of the Mansbridge estate at the old Bismarck Trail crossing on Rabbit Creek where his father ran cattle in connection with his general store and postmaster duties. In 1923 he won the saddle bronc championship belt of British Columbia and according to Charles Wilson, of Buffalo, made the best ride on the famous bucking horse "Tipperary" at a Lemmon Fair. For several years he sponsored a matched saddle bronc ride at the Faith rodeo." While the clipping isn't dated, if Babe passed away on January 21, 1968, the clipping probably ran in a local paper and funeral services were held on Wednesday, January 24th. Editor's Note--Apologies to any copyright holders for the above newspaper clipping. I have no information as to the newspaper or the clipping's provenance other than that it was in my grandmother's photo album. On July 15, 2009, I was on a business trip to the area and attended a Tribal Council meeting at Eagle Butte on the Cheyenne River Sioux Reservation. There was a visiting delegation of federal officials, and the Council wanted to have a session with the people from Washington, which turned into a long 2-1/2 hour procession of speeches by local tribal members about all of the various needs and complaints on the reservation. It appears to be traditional for tribal elders to be allowed to speak before the real business begins. But, so many community members were interested in speaking that this turned into the primary business of the meeting. A long litany of grudges with Washington were expressed, many of them perfectly understandable. Anyone with a knowledge of the government's interaction with the Lakota over the years – especially in the early years when people were rounded up and placed on the reservation, and later when the reservation lands were chipped away to be sold off for white settlement – would understand that many historical wrongs were committed. One such wrong -- the Wounded Knee Massacre -- occurred in December 1890 when U.S. troops got a little too trigger happy during a roundup of tribal members and killed over 300 men, women, and children. The massacre still resonates strongly, and one of the things tribal members asked for on July 15th was a formal apology from Washington for the Wounded Knee Massacre. People at the Tribal Council session also asked for federal help with some things that sounded strange to non-tribal ears. For example, one local woman, who left before I could talk with her personally, asked Washington for help dealing with Walking Sam. The woman, who was elderly but otherwise quite lucid, described Walking Sam as a big man in a tall hat who has appeared around the reservation and caused young people to commit suicides. She said that Walking Sam has been picked up on the police scanners, but that the police have not been able to protect the community from him. She described him as a bad spirit. She wanted help from Washington with foot patrols for the tribal communities to protect them from Walking Sam. At the time, I was thinking that this may have been a reference to Bigfoot sightings. Yes, some people have claimed sightings of big hairy ape men in the Dakotas. Many of these sightings have taken place on the Standing Rock and Pine Ridge reservations. Or, perhaps it may just have been a plea for help with teen suicides – a plea that needs to be translated through a cultural filter. The woman was from Red Scaffold, which is a small community on the reservation. The following evening found me perusing the bookshelves at Prairie's Edge, a large Native American arts, crafts, music, and bookstore in Rapid City. I looked through quite a number of books trying to find any reference that I could to Walking Sam. I found nothing. I did ask the clerk behind the counter if she knew of any appropriate books or had ever heard of Walking Sam. She appeared to be Native American. She wasn't familiar with Walking Sam, but advised me that there really are bad spirits out there on the reservation, and you need to be careful. She said that if you go looking for them, you might just find them. Well, I didn't go looking for Walking Sam, but I did stay in a town that weekend that straddles the edge of the Cheyenne River Sioux Reservation. I also ended up talking with the town's police chief and emergency services manager. (I won't name the town or the police chief because I haven't had a chance to ask whether he would mind being identified.) We got to talking about the local Native American beliefs and I mentioned the incident at the council meeting in Eagle Butte. He immediately was interested in knowing who had mentioned Walking Sam because he thought he probably knew the woman. He knows many of the locals in Red Scaffold and is familiar with the stories about the Walking Sam sightings and the connection to teen suicides. He often runs ambulances down to Red Scaffold and over time has gotten well acquainted with the locals. Following the incident, I corresponded with Loren Coleman, a cryptozoologist who has written many books on the topic, and he thinks that it's a good bet that Walking Sam represents sightings of Bigfoot, more commonly spotted in the Northwestern U.S., but also often sighted elsewhere. It's an interesting story, but shouldn't distract the reader from the fact that people on the reservations are distraught about teen suicides. Whether Walking Sam represents Bigfoot, an evil spirit, or is just a manifestation of the fear that people have about losing their loved ones to what seems an incomprehensible type of event, the teen suicides are real. Editor's Note--Another blogger here has a much more expansive take on the notion of cultural filters that is a valuable one. While we westerners to tend to see things in the black and white (e.g., a report of a strange creature is an animal, or it is not) and through our own cultural filters, we do lose sight of the fact that cultural filters are strong and may cause us to lose sight of an underlying message which could be something that we could easily relate to. For example, believe in "bad spirits" as a causative mechanism for untimely events among the Lakota is strong. Walking Sam may be just one such explanation that resonates among some of the Lakota for teen suicides. Alternatively, it is intriguing that Loren Coleman has pointed out that police thermal imaging scanners have picked up a heat signature from one possibly related sighting in the past here. Loren also posts some additional thoughts on the matter here.